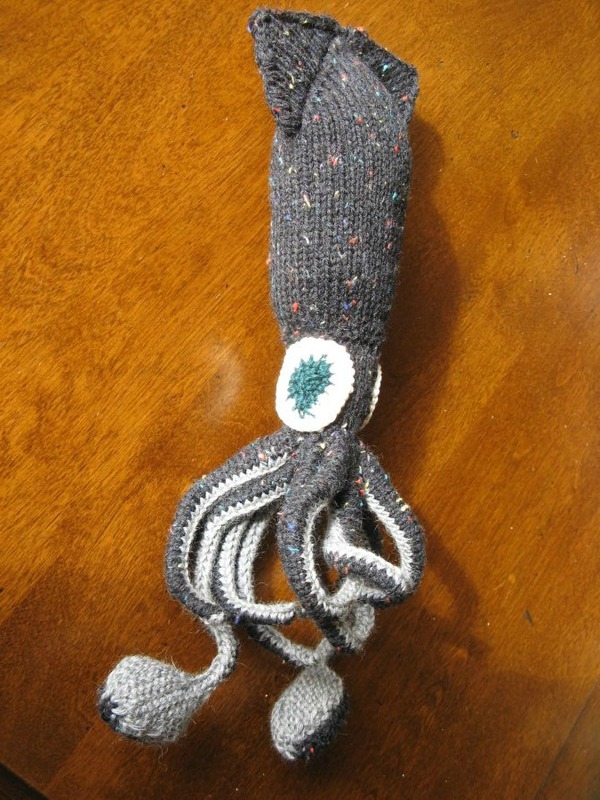 Here’s a giant squid (aka kraken) to add to my collect of strange knitted stuff (which already includes the Loch Ness monster, an octopus, and a jellyfish). The pattern is another Hansi Singh gem from her book Amigurumi Knits. In an effort to use up yarn in my stash, I mixed some yarns of slightly different weight. The white I used for the eyes was considerably thinner than the other yarns, so I doubled it, which made the knitting a little fussier, but not much. Making the legs was a little repetitive, although the pattern was simple enough I had it memorized before I was half-way through. 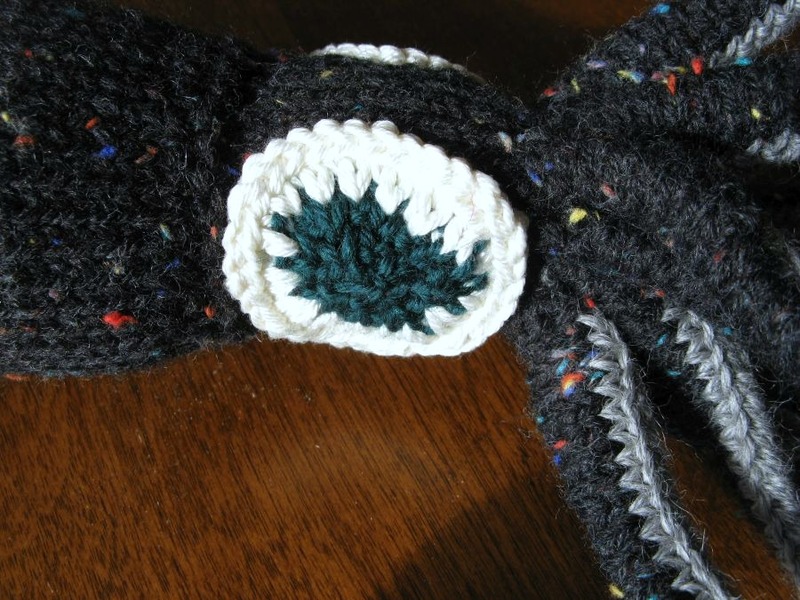 The biggest challenge was picking up stitches to knit the mantle and the fins. I like the finished look of added pieces that are knit directly onto one another instead of sewn on later, but it can be tricky to get that first couple of rows knit. In this case, I think it was worth the effort. I keep thinking I will start developing creature patterns of my own, but it hasn’t happened yet. I love how these project look, but they are complex and require concentration and that’s following someone else’s pattern. Making my own pattern will be even harder. 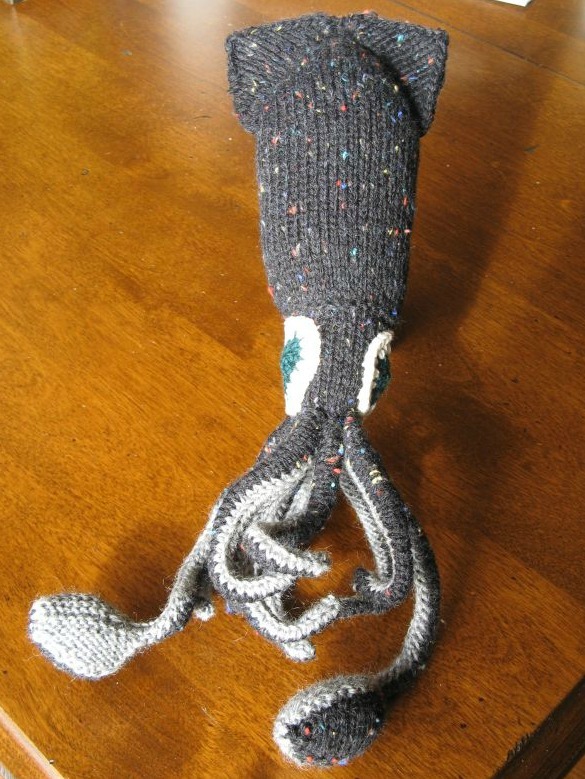 Right now, I need me some mindless knitting. I found an unfinished sweater in my closet, so I think I’ll work on that for while. It makes sense, now that spring is here. Right? I love making this sort of stuff. My husband used to study sperm whales and giant squid so I think it will go live in his office. Thanks! Her patterns are all amazing.